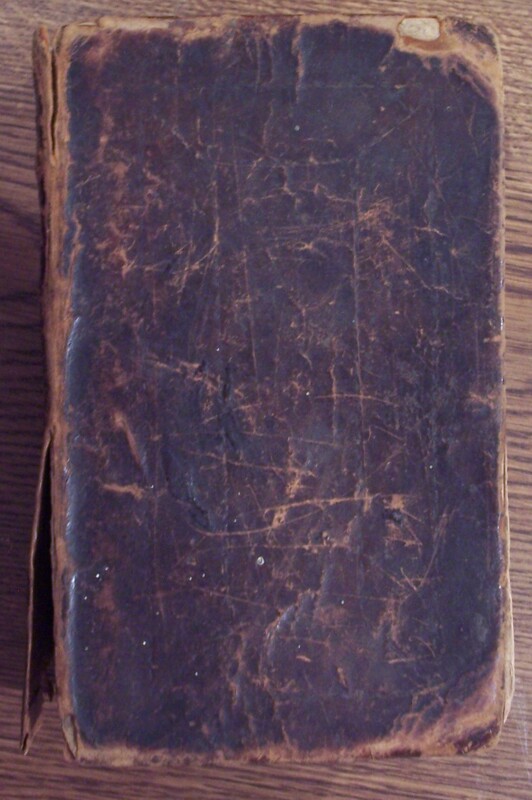 Warren and Nancy McNeill Family Bible, Holy Bible, (New York: The American Bible Society, 1828); original owned in 2014 by Marieta (Pehrson) Grissom (Indianola, IA 50125). The Bible is 4½” by 7½” by 2¼” thick, and has a well-worn leather cover. In somewhat dilapidated condition, it is possible other pages are missing, however, the birth page is in tact and secure in the binding of the volume. The person(s) who wrote the entries was literate, but not accustomed to writing, as evidenced by the inconsistent capitalization and punctuation, and difficulty judging how much space it would take to record a date and having to continue to another line. Warren (1810-1868) and Nancy (1812-1870) were my great-great-great grandparents; I’m descended through their son Alfred. This Bible is OLD! How many of us have artifacts that have been touched by so many generations? How many of us have actual samples of penmanship by a family member 180+ years ago? 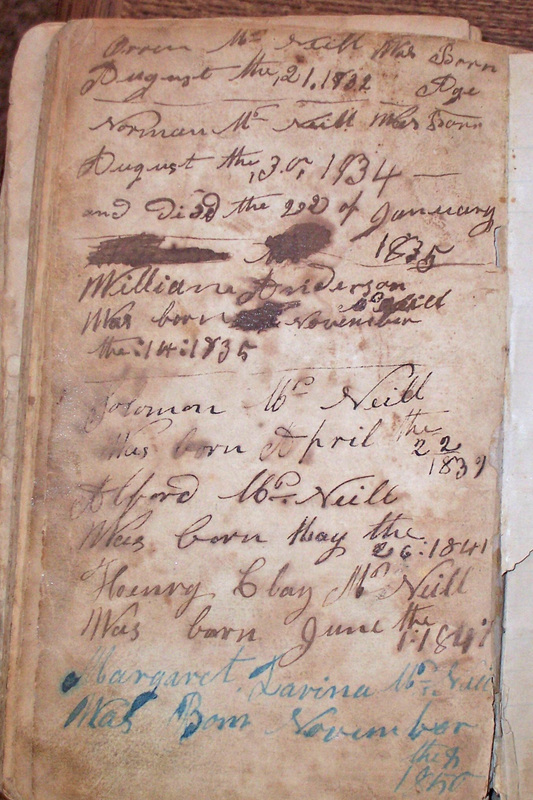 The McNeill Family Bible apparently passed from Warren and Nancy McNeill to their son Alfred McNeill, to his daughter, Edith (McNeill) Morrill, to her son, Ernest Morrill, then, to his cousin, O. R. Pehrson, a grandson of Edith’s brother, Leonard, in approximately 1984. My mother, Thelma Pehrson, gave it to me in July 2006. This Bible is a family treasure; it must be preserved and saved for the generations! You are so right, what a great treasure. It is very rare that something like that stays in a family for so long.